According to Preferred Consumer, it’s estimated that 50 percent of people have teeth that are crooked, not aligned properly, or irregular. Fortunately today, orthodontics has advanced to the point where corrective devices, such as braces and retainers, are less obvious, more comfortable, and can be worn for shorter periods of time. The other main oral issue that orthodontics helps correct is uneven alignment, such as an underbite or an overbite. You might hear Dr. Glaser refer to this as a “malocclusion,” which means “bad bite.” Braces can help rearrange your alignment so an overbite or underbite is less of a problem. Typically after the braces come off for this sort of treatment, patients need to wear a retainer from Glaser Orthodontics to finish the treatment. While braces are typically associated with dental issues in children, more adults are wearing the devices as well. According to USA Today, about one in every five braces wearers are adults; a sign that it’s never too late to correct any oral issues. Part of this is due to the technological advancements in orthodontics. For instance, new braces feel much better and come in a variety of styles — including clear — so they’re far less obvious. Plus, the wires on braces are now made from advanced metals, which are stronger and lighter, so they get the job done much more efficiently. With so many people wearing braces these days (according to the Pennsylvania Dental Association, about four million people in the US wear braces at any given time and many more have worn them at some time in their lives), nicknames like “metal mouth” and “brace face” are almost a thing of the past. What’s more, is that insurance plans are increasingly covering orthodontic treatment, making braces a much more feasible option for families on a budget. When weighing whether or not braces are in your future, it’s important to study all of your options about the styles of braces and what treatment option is best for you. Also be sure to contact your insurance provider to see what is covered and what will have to be paid out of pocket. It might take a few years of treatment, but braces can give you that winning smile for the rest of your life. Call our Cortlandt Manor NY office with any questions you might have or visit our website! Braces are an investment in your smile. When your teeth reach a desired straightness, you’ll have a beautiful smile, but it’s important to keep it that way! You can accomplish this with a retainer provided by Glaser Orthodontics. When we remove your braces, Dr. Glaser will evaluate the condition of the bone structure surrounding your teeth and determine how well it is adjusting to the new position of your teeth. For the first few months, we may require you to wear your retainer both day and night, except during meal times and for brushing and flossing. Remember, wearing your retainer is an investment in your smile. If you fail to wear it consistently, the tissues that support your teeth will be unsupported, and you may begin to experience noticeable shifting. You’ve worked hard to get that beautiful smile — your retainer will let you keep it! Remember to call our Cortlandt Manor office if you have any questions about your retainer! What Attracts People to a Smile? The mere fact that you are smiling — You won’t believe how a negative attitude can have a domino effect on others and the rest of your day. The mere fact that you are smiling already has a positive effect on you and the people around you! The overall quality of your smile – Consider the aesthetics of your smile. If you have straight teeth but the surface is discolored, it can be distracting and unattractive. However, this is an easy fix. You can simply look for an over-the-counter solution for teeth whitening. For severely stained teeth, talk to Dr. Glaser about professional teeth whitening. The straightness of your smile — If you have crooked, misshapen, chipped or damaged teeth, have no fear! Simple misalignments are easy fixes, and you will be on your way to a picture perfect smile in no time. There are plenty of modern solutions, including, but not limited to, traditional braces. Don’t worry about having to wear metal on your mouth, because there are other options like ceramic braces or Invisalign which can be worn to straighten your teeth and get that perfect smile! The sincerity of your smile — Finally, make sure that your smile is sincere and genuine. Whether it’s for the cameras or if you simply want to make someone’s day, a sincere smile will make a world of difference! If you are interested in achieveing the perfect smile, contact Dr. Glaser at his Cortlandt Manor NY office! 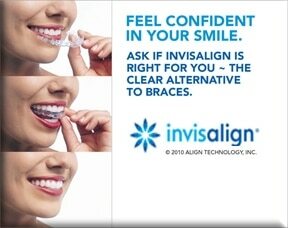 Invisalign has become a popular treatment amongst the teens and adults of today. Invisalign has many advantages over braces, and may be the perfect option for you! Consider some of these key points, and stop in to talk to Dr. Glaser about getting your Invisalign today! It is much easier, and more effective, to brush your teeth! The cost is generally the same, even with all these terrific benefits! There is no reason not to love Invisalign! They are a convenient, comfortable, and effective alternative to braces. Let us make your Invisalign experience easy, and make your smile a winner! Call Glaser Orthodontics in Cortlandt Manor NY today for a free consultation!